Philippine Flowers Delivery | Send gifts & flowers to Philippines on valentines day | You Are In My Heart ! You Are In My Heart ! 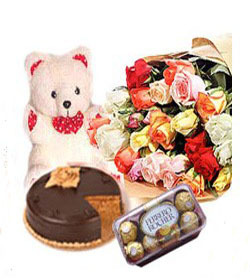 A delightful living gift suitable for any occasion 9 inches teddy Bear give hugging feelings with ferrero cholates, chocolate cake & 24 mix roses bunch express your love, a perfect gift to express your emotions. The productr is only for metro manila,cavite,bulacan,rizal,laguna.